Strange one for you all.. I love the night sky(who doesn't)..Any great places to camp where the night sky is not affected by light pollution..MilkyWay and all love, camping out this time year but yet to see the night Sky at her best. Million and one places. Anywhere not too close to a sodium-blighted settlement really. I've seen some cracking skyscapes in Glencoe. Galloway has it's own officially designated dark sky park so it's a definite hotspot for lack of light pollution. I saw the Milky Way when staying at Polskeoch bothy along the Southern Upland Way (15-16 km from Sanquhar). 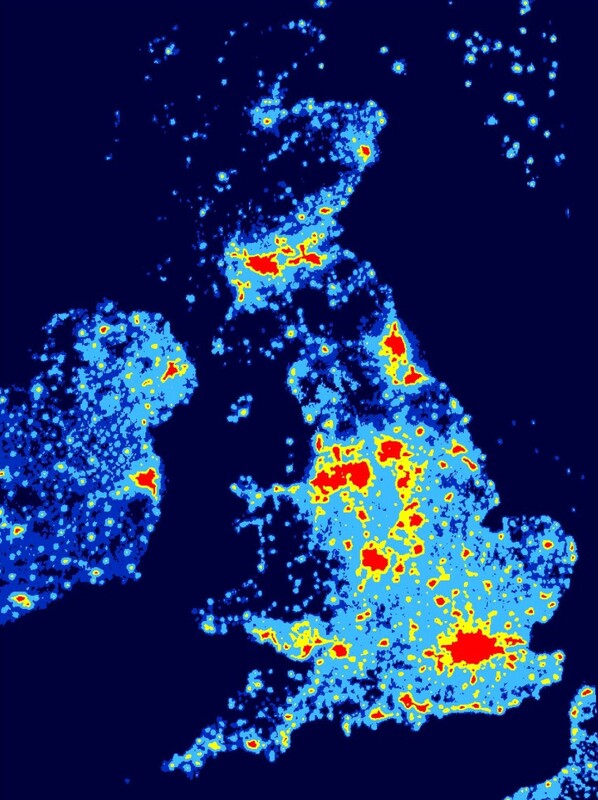 This might help - unsurprisingly the darkest parts of the map are the ones with the lowest light pollution. I've heard the Kielder Forest in Northumberland officially has the darkest skies in England but there are plenty of other places. We stared into the Milky Way in Glen Shiel on a cloudless night, that's the clearest I've ever seen it. Skye and anywhere up the west highlands and islands away from settlements with street lighting. I got photos of the Aurora Borealis on Skye, and spent a long time watching a meteor shower over the Sea of Hebrides from Arisaig whilst wandering home from the pub to the campsite. The glens of the Eastern Cairngorms are good too. A decent pair of binoculars are better, cheaper and more easy to carry than a telescope. Also you can watch wildlife with them in the day time. I'm afraid this may not be very helpful, but the best night sky I have ever seen was camping out in the high Himalayas in Nepal, near Everest. With the thin air and no light at all, the night sky was simply amazing. The best I have seen in this country was in the Fisherfield - again, very dark. Campsite outside of Killin is good especially if you head up the road to the old visitor centre at Ben Lawers, that's the area where I have seen milky way best around early October. Around Braemar would be good too. I once camped at the base of Slioch - midge epoch. The sky was worth it however, with no moon we could see more stars than you could shake a large stick at. It's worth noting that it isn't just light pollution that can degrade the quality of a night sky, but also the so called seeing conditions. Even miles away from sodium street lights a humid or dusty night (even one that appears cloud free) will not produce great stargazing. I've seen the Milky Way from just outside the city of Durham on a cold, crisp winter's night, and yet struggled to see more than just a few of the brightest stars whilst camped beside the upper River Feshie, all because of how transparent the sky was. To get the best opportunities to see things like the Milky Way and the Andromeda Galaxy you need to factor in the atmosphere and weather conditions alongside finding a good spot away from street lights. In general a cold, crisp winter's night will be better than a damp, mild autumn night. Usually the "best" skies are in the wake of a weather front - the air is generally much clearer and calmer and you'll get some stunning views. So whats the best way to photograph the stars if you get a clear night? Would it be as simple as having the camera on a tripod and a manual shutter speed? RicKamila wrote: So whats the best way to photograph the stars if you get a clear night? Superb!! Am heading to Skye in a couple of weeks, so hope to try this then.